"Brain Age: Train Your Brain in Minutes a Day!, also known as Dr. Kawashima's Brain Training: How Old Is Your Brain? in PAL regions, is an entertainment video game that employs puzzles. It was developed and published by the video gaming company Nintendo for the Nintendo DS handheld video game console. Nintendo has been careful not to claim the game has been scientifically validated, however stating that it is an 'entertainment product "inspired" by Dr. Kawashima's work' in the neurosciences. It was first released in Japan, and was later released in North America, Europe, Australia, and South Korea. 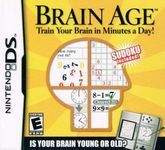 It was followed by a sequel titled Brain Age 2: More Training in Minutes a Day!, and was later followed by two redesigns and Brain Age Express for the Nintendo DSi's DSiWare service which uses popular puzzles from these titles as well as several new puzzles. Brain Age features a variety of puzzles, including stroop tests, mathematical questions, and Sudoku puzzles, all designed to help keep certain parts of the brain active. It was included in the Touch! Generations series of video games, a series which features games for a more casual gaming audience. Brain Age uses the touch screen and microphone for many puzzles. There has been controversy over the game's scientific effectiveness." Source: Wikipedia, "Brain_Age:_Train_Your_Brain_in_Minutes_a_Day!," available under the CC-BY-SA License.